University of Rochester engineers have developed a computer program that gauges human feelings by analyzing 12 features of speech, such as pitch and volume, to identify one of six emotions from a sound recording with 81 percent accuracy. 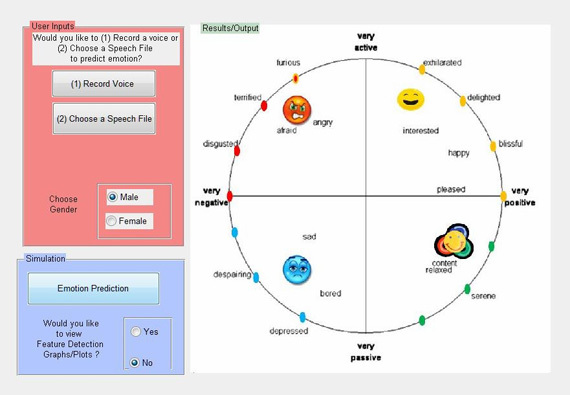 The program has used to develop a prototype of an app that displays either a happy or sad face after it records and analyzes the user’s voice. It was built by one of Heinzelman’s graduate students, Na Yang, during a summer internship at Microsoft Research. Rochester psychologist Melissa Sturge-Apple, who is using the program in research on parent-teen communication, explained that emotion affects the way people speak by altering the volume, pitch, and even the harmonics of their speech. The researchers established 12 specific features in speech that were measured in each recording at short intervals. The researchers then categorized each of the recordings and used them to teach the computer program what “sad,” “happy,” “fearful,” “disgusted,” or “neutral” sound like. Previous research has shown that emotion classification systems are highly speaker-dependent; they work much better if the system is trained by the same voice it will analyze. Their new results also confirm this finding. If the speech-based emotion classification is used on a voice different from the one that trained the system, the accuracy dropped from 81 percent to about 30 percent. Once the algorithm gets further developed (so it’s more speaker-independent and operates in real time), perhaps this system could do the impossible: improve automated customer service? For example, an angry customer could be routed to a supervisor. Also, how about combining this data with electrodermal-response data from Affectiva’s Q Sensor (which uses the same two dimensions of emotion (arousal: calm to excited, and valence, negative to positive)?